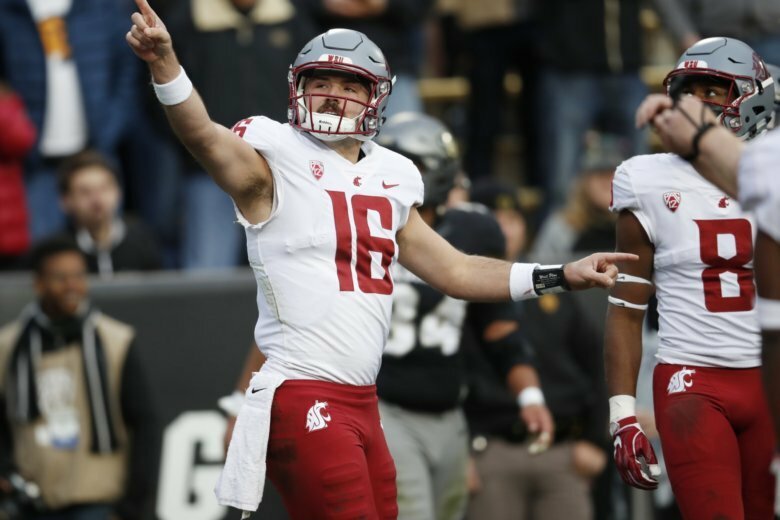 PULLMAN, Wash. (AP) — A year that began in tragedy for Washington State is wrapping up with the Cougars on the brink of unparalleled success. Players began spring workouts with heavy hearts after the January suicide of quarterback Tyler Hilinski. The offseason departure of six assistant coaches and head coach Mike Leach’s flirtation with the Tennessee job then contributed to the outside perception that little should be expected of the Cougars this year. They were picked to finish fifth in the Pac-12 North. “Everyone was projecting us to go 3-9,” freshman running back Max Borghi said. The picture today is so much different. Washington State (10-1, 7-1 Pac-12) will play No. 16 Washington (8-3, 6-2) on Friday in the Apple Cup. A victory would give the seventh-ranked Cougars their first Pac-12 North title and set a program record for wins in a season. It would also keep alive talk of Washington State’s longshot bid for the College Football Playoff, however unlikely that may be. Leach said the team’s secret weapon may be how much everyone is enjoying themselves. Having perhaps the best time is quarterback Gardner Minshew, the graduate transfer from East Carolina who became a star in his first and only season for the Cougars. Minshew has captured the imagination of fans with stellar play, as well as his facial hair. Minshew is nicknamed the Mississippi Mustache and it has become a thing among Cougars fans to post a selfie while sporting a fake mustache. After one recent game, Minshew sneaked up behind Leach as the coach was conducting a television interview and slapped a fake mustache on his upper lip. “I was the victim of a cruel joke,” Leach said later. Minshew has become one of the faces of college football this season, mobbed by fans, pursued by reporters, pushed as a Heisman Trophy candidate. All the success comes from working as a team, he said. Leach also is having a ball in his seventh season at Washington State. He’s often relaxed when meeting the media, happy to answer offbeat questions. Asked what bands he would like to see at a Woodstock-style festival in Pullman, he said The Doors, Lynyrd Skynyrd and Jimmy Buffett, then added 10 more. Of course, what’s really fun is winning. The Cougars won their first three games then stumbled at Southern California, losing a close game when they missed a tying field goal in the closing two minutes. They have since won seven straight. But that doesn’t mean Leach is confident of victory each week. “This is not a business for rational people,” Leach said. It’s been a long road to get to this point. In January, the team was mourning the suicide of Hilinski, who was expected to start at quarterback in place of the graduated Luke Falk. Players still hold his memory close. Leach said Hilinski’s death was hard on everyone. “We went through a lot of adversity, obviously, with Tyler’s passing, which everybody misses him,” Leach said. With Hilinski gone, Leach knew he needed an experienced quarterback to run his offense. That led him to Minshew, a part-time starter at East Carolina who was planning to ride the bench at Alabama this season in preparation for the start of a coaching career. Leach called and asked if Minshew would prefer to lead the nation in passing. Minshew said yes and showed up on campus in May. He now leads the nation in passing yards with 4,325, and has thrown for 36 touchdowns against just seven interceptions. As a result, the Cougars have launched a Heisman campaign for Minshew, sending voters a fake mustache. Leach thinks Minshew should get strong consideration. Washington State at this point is the Pac-12’s only chance to make the four-team playoff field. But even if the Cougars beat Washington and win the conference championship game, they might very well fall short. Not that it would make the season any less remarkable for Washington State. “Watching how we came together in camp,” Minshew said. “I had no doubts we could do something special.